The Swift language is always evolving. Bugs are being fixed, new proposals are implemented, etc. It'd be great if we could try out these features out as they're being implemented, without having to wait for official releases. Today we'll take a look at how to download, install, and try out the latest Swift Toolchain in Xcode. Let's get started! 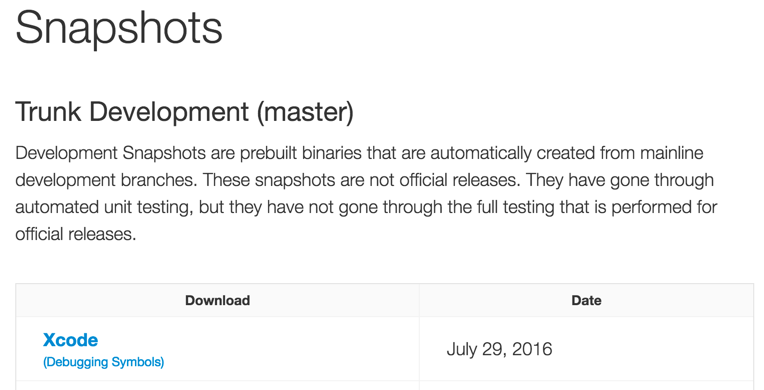 We'll begin by heading to https://swift.org/download/ and looking for the "Snapshots" section. Here we can also find many other preview releases, etc. We'll run open the installer, and complete its steps. We can now open Xcode and select our new Toolchain. With our new Toolchain selected, all builds will use it, neat! Getting involved with Swift's development is a great way to stay informed on where things are headed. We'll look at getting even more involved in future Bites!